We just received another great update from Mary Kathryn. All five embryos are still going strong. The goal for today was for them to have divided into 8-10 cells. They are currently at 7, 8, 8, 10, & 12 cells! We are set for the transfer on Monday at 1:15pm in Oklahoma City, again. We will not be receiving another update tomorrow as our embabies will not be checked again until the day of the transfer. The most change occurs in these next 2 days. We are thrilled and couldn’t be more ready for Monday! Last night, we continued the Progesterone shot. Todd is still doing a fabulous job of not causing me much pain. However, I’m definitely starting to bruise a little. I’m still doing massages and heat on the injection sites in hopes that it will keep me from getting too many knots. Other than that, we are both feeling better each day. Julie has been here since last night, and we are loving her company. We are all getting some much needed rest, chatting, and laughing. Yesterday, Todd finished a project that will make next week more bearable. 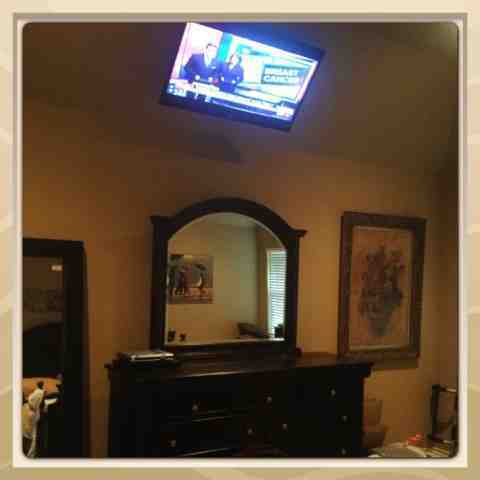 He hung our TV on the slant of our bedroom ceiling. He’s so wonderful! Here’s one more shot of what two of our embabies look like. It’s an 8 cell embryo. 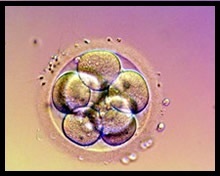 This is an 8 cell embryo. I may not update tomorrow, but I’ll definitely do some updates on Monday. Have a fabulous last half of the weekend! Okay, I have assembled our cheer team at church. Some cheer and some pray. They are a very spirited group. Waiting on tomorrow to hear even more fantastic results! Go Baby Provence!